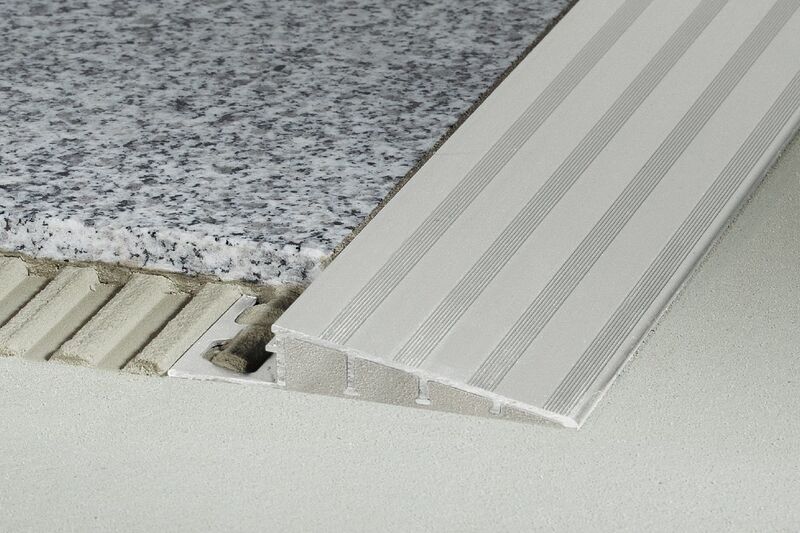 Schluter®-RENO-RAMP is designed to provide a smooth transition between tile coverings and floor coverings at lower elevations or finished concrete, particularly in commercial applications where wheel carts are used (e.g., bakeries, hospitals, etc.). The profile is available in anodized aluminum. RENO-RAMP features a trapezoid-perforated anchoring leg, which is secured in the mortar bond coat beneath the tile, and a sloped transition surface that terminates at the height of the tile edge. The profile protects tile edges and provides a sloped surface to eliminate trip hazards and allow easy access for wheel carts. RENO-RAMP features an integrated joint spacer that establishes a defined joint cavity between the tile and the profile. 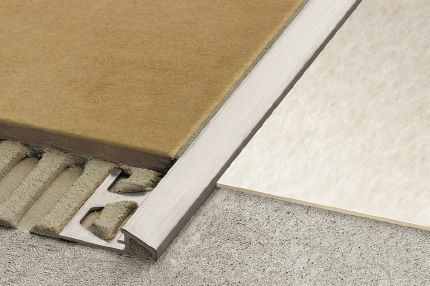 Schluter®-RENO-RAMP-K is a variant of the profile without an anchoring leg. 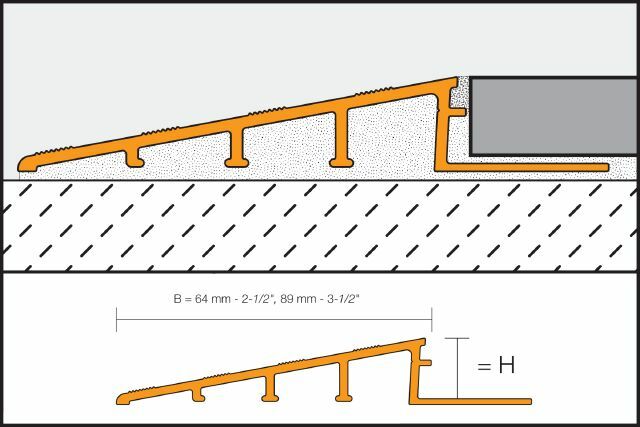 Note: When using Schluter® uncoupling membranes with RENO-RAMP profiles, factor in the thickness of the membrane over the anchoring leg when selecting the profile height. 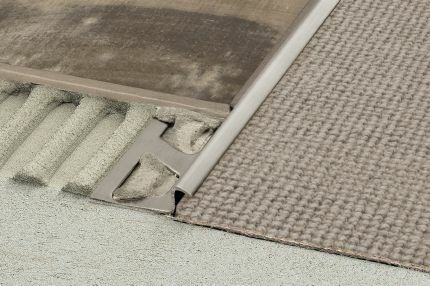 RENO-RAMP-K is installed adjacent to existing floor coverings, e.g., retrofitting between existing floor coverings and bare concrete without having to disturb the existing flooring. All sizes of RENO-RAMP, except sizes 9/16" (15 mm) and 3/4" (20 mm), are compliant with the Americans with Disabilities Act (ADA). 1. 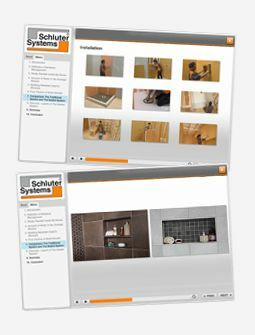 Select Schluter-RENO-RAMP according to tile thickness and format. 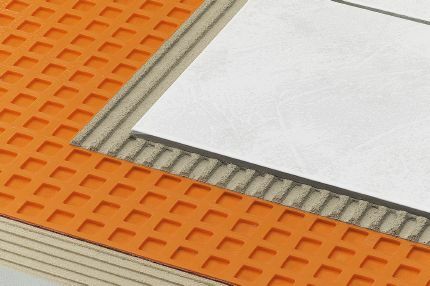 Note: When using Schluter® uncoupling membranes with RENO-RAMP, factor in the thickness of the membrane over the anchoring leg when selecting the profile height. 7. Set the tile to the integrated joint spacer, which ensures a uniform joint of 1/16" - 1/8" (1.5 - 3 mm). 9. Work with materials and tools that will not scratch or damage sensitive surfaces. Setting materials and grouts must be removed immediately, especially from anodized aluminum surfaces. 1. Fill the cavity beneath the sloped section of the profile with thin-set mortar. 3. Press the profile into the mortar and abut to the adjacent floor covering. The profile should not be higher than the adjacent floor covering, but rather up to approx. 1/32" (1 mm) lower. 4. Fill the joint completely with grout or setting material. 5. Work with materials and tools that will not scratch or damage sensitive surfaces. 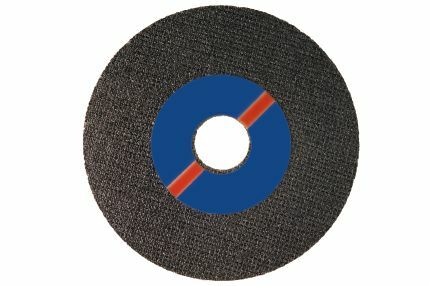 Setting materials and grouts must be removed immediately, especially from anodized aluminum surfaces. The Schluter®-RENO-RAMP and RAMP-K profiles require no special maintenance or care and are resistant to mold and fungi. Clean profiles using common household cleaning agents. Oxidation films on exposed aluminum can be removed by using a conventional polishing agent, but will form again. In the case of anodized aluminum, do not use abrasive cleaning agents.